CriminalThinking.net has developed a new creative brand and logo that features a flaming light bulb with a finger touching as the bulb shatters. This compelling logo eludes to the idea of breaking criminal thinking patterns. The concept was created by the talented graphic artist Angela Martinez. 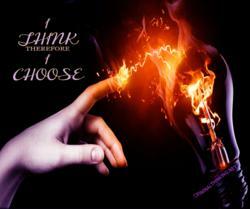 Angela creates inspirational graphics for the CriminalThinking.net Facebook and Pinterest accounts and her flaming light bulb concept was inspired by a recent quote, "I Think, Therefore I Choose." New social media sites include a Twitter account and Pinterest board. Website author, Brian Loebig says, "Twitter will be used to connect to substance abuse programs, corrections professionals, therapeutic and recovery centers as well as individuals who have embarked on their own criminal thinking change process." The Pinterest board will be used to distribute and share inspirational graphics that further define and creatively describe the "criminal thinking" change process. Author of CriminalThinking.net, owner of LoebigInk.com and part-time Technology Manager for the Alliance for Performance Excellence, Brian has over 15 years of experience working as a practitioner and administrator in the corrections, substance abuse and human services fields with a special emphasis on technology. He continues to work with numerous community-based non-profits as a web technology consultant, board member and volunteer. The CriminalThinking.net site has been developed collaboratively by practitioners, in the corrections and substance abuse treatment fields, who have offered content, recommended links, suggested improvements and provided information. All primary material is provided free of charge. Supplemental materials are offered for a fee and help with the development and creation of new materials on the site.